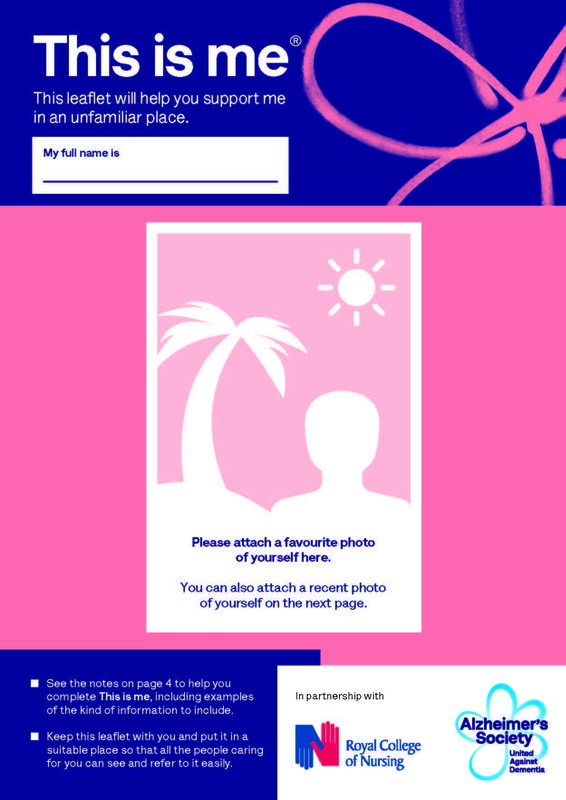 Alzheimer’s Society has created a simple but powerful resource to support a person to easily share information about themselves when they’re in an unfamiliar place. It enables health and care professionals to better understand an individual’s preferences and needs so they can provide more person-centred care. The leaflet helps health and social care professionals to better understand who a person really is, which can help them deliver care that is tailored to the person’s needs. A new version of This is me was published last week. The 2019 review of the leaflet was informed by comprehensive feedback from people living with dementia, carers and professionals in dementia care. As a result of their suggestions, the updated leaflet includes new categories, more space to write information and a fresh design. It also has improved guidance notes with useful examples of the kind of information you can include. This is me is a valued resource that has helped to transform care for thousands of people in hospitals, care homes and those living at home, with more than 840,000 copies distributed. It has also been endorsed by the Royal College of Nursing since its initial launch in 2010. This is me should be filled in by the individual(s) who know the person best and, wherever possible, with the person involved. It should be kept where everyone who cares for the person can easily refer to it. It should also be taken to any new location – for example if the person goes into hospital or a care home – and given to any new people who contribute to the person’s care. The new This is me is available online – you can download and print a copy to fill in by hand, or you can complete and save the leaflet electronically, so that you can update it at a later date. It is currently available in English, and a bilingual Welsh/English version (Dyma fi) will be available soon.